Does back to school season get so stressful for you that you start going gray or pulling your hair out? Do tantrums over getting out of bed, eating breakfast or getting dressed have you running out the door late on those first days back to school? 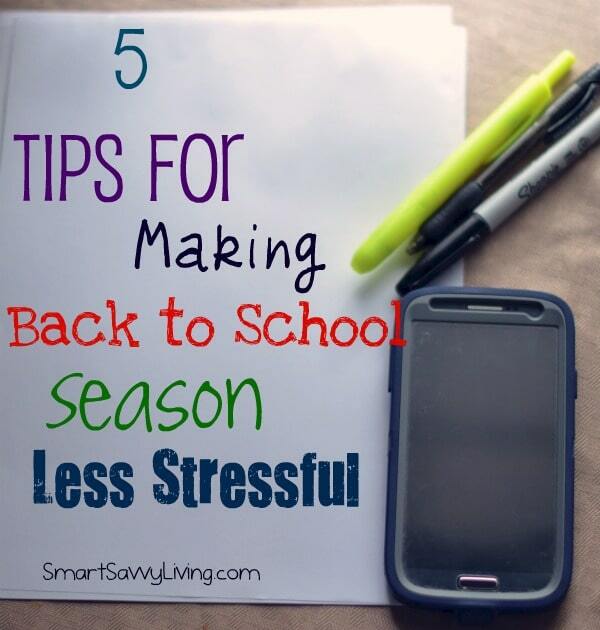 Take a deep breath and try these 5 tips for making back to school season less stressful. 1. Start getting into a routine early. One of the toughest things about school starting back is getting up early, not only for the kids, but also mom and dad! At least a week or 2 before school begins, start getting back into the routine of every one going to bed at the normal school hours. Then, the toughest part – getting up and getting their before school routines set back into habit. It’s so much easier than having to drag them out of bed and the door at the last minute! 2. Have a supplies checklist. I’m the world’s worst at going shopping and not having a real list. It never fails that I forget something I really needed right when we get home. Many schools now send supplies lists for the school year before school is back in session, so it can be such a stress-saver to take the time to go through the list, see what you already have, and then make a list of what you need to pick up. 3. Plan for quick breakfasts and lunches. Preparing meals for the next few days on Sundays and Wednesdays seriously saves my sanity. Instead of waiting until the last minute (can you tell I’m a procrastinator? ), have the kid’s breakfasts and lunches prepared to heat up in the morning and walk out the door with. Have picky eaters? Sit down with the kids and help them come up with 5 – 10 different meal combos that they like so you aren’t getting food frustrated first thing in the morning. 4. Pick out tomorrow’s outfit the night before. The kids often love dressing themselves but it’s not always what I’d let them go to school in! Have them pick out 1 or 2 outfits that they’d like to wear the next day before bedtime. This will save from having them spend 15 minutes trying to decide and arguments and tantrums on what they can wear. 5. Plan daily schedules in advance. Okay, so I already admitted I’m a self-proclaimed procrastinator. I’m usually good at remembering dates of things, but I also drive myself nuts trying to remember all the daily events and deadlines I need to keep up with for the family. It’s totally not cool to be the mom or dad that forgot to sign the permission slip on time or the science fair project! That’s why I almost always have my smart phone glued to my hand. It’s such a wonderful tool, not only to stay in touch via phone, text and email with the family, but also to keep our lives scheduled. Since we all have them, we can easily text each other with any last minute schedule changes and forward any important email news. My favorite part, though, are the calendar apps. We can all share the calendar as a family so we never miss anything from a doctors appointment to the school’s trip to the zoo. Plus, it’s become my favorite alarm clock. I especially love the feature that allows my alarm to start off as a quiet soothing song that slowly gets louder to wake me up. It’s so much better than waking up to those blaring alarms! I also use the alarm feature to help me keep track of appointments just in case I forget to look at the calendar or miss the alert. I’m all about being prepared any way I can! Lastly, I love that I can keep all of our family’s important contacts listed together and have several lists all in one device. I am so bad about writing something down on a piece of paper to remember later. Of course, shortly after that piece of paper is gone forever…or until I finally clean my desk off 3 months later. Now I can have teacher, doctor, etc. contacts all in my phone instead of searching high and low along with a grocery and school supply list instead of trying to remember everything the next time I go shopping. 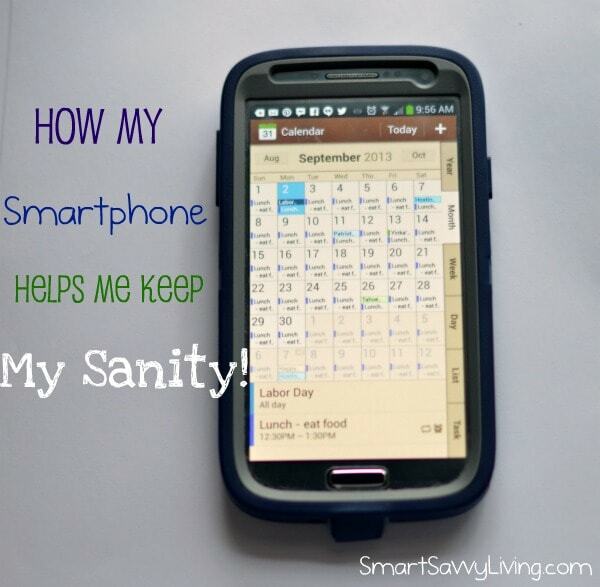 Sometimes I seriously feel like my smartphone is my extra brain! Do you have any other Tips for Making Back to School Season Less Stressful? Great tips! I definitely need to start getting into a routine!